What's not to love here? Jane Eyre meets Rebecca in Mexico in this contemporary Gothic romance (contemporary as in the 70's). Granted, I'm a little biased because I read this book first as an impressionable teen but this second read after so many years didn't diminish the magic. 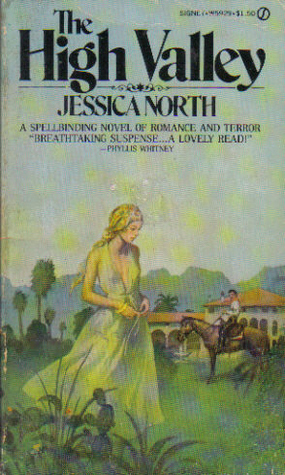 It has everything: a lush exotic locale, handsome and dangerous men, insane relatives, and the haunting mystery of a woman whose fate our heroine might well share if she doesn't watch out. It is also beautifully old-fashioned: "I love you" comes before even a kiss. A good smoldering read. Too many holes that I couldn't get past. For instance, how can a family live in a Mexican compound that is supposed to cater to wealthy horesemen, and yet the inside of the manor shows signs of neglect like threadbare carpets and some rooms that require a temporary generator because of wiring problems? I also couldn't get past the cheesy descriptions of the Mexican men who were supposed to be modern-day Don Juans, but still used pomaide in their hair. Gross. I was bored. Kind of typical but not bad for light reading !